As technology evolves, so do the fields that rely on technology to do business. Since the 90’s, the internet has drastically changed the way businesses use marketing. With 1.2 trillion searches on Google a year, it’s no surprise that LinkedIn listed Search Engine Marketing/Optimization (SEO/SEM) as the 8th most in-demand skill by employers in 2018. SEO is rapidly becoming an integral part of successful marketing campaigns. In order for those campaigns to truly be successful and reach the right audience, businesses need employees with a strong background in SEO. Employers are experiencing an SEO and analytics skills gap where the demand far outstrips the supply in the current job market. This, in combination with the 94% of marketers who reported that marketing automation platforms are appealing them, has driven the creation of dozens of SEO automation services. These automation platforms give marketers the ability to drastically reduce the time spent retrieving and analyzing data from AdWords and often produce more comprehensive reports on data than what appears on the AdWords dashboard. Optmyzr, a relatively new SEO automation tool, is changing the way digital marketers optimize their campaign keywords. Founded by ex-Google AdWords employees, Optmyzr’s software is designed to simplify pay-per-click marketing and reduce the time digital marketers spend on compiling data and performing tedious tasks. To test out Optmyzr, I linked it to my AdWords account where I ran a small campaign for my marketing blog a few months ago. Like Google AdWords, Optmyzr’s home screen is your “Dashboard”. 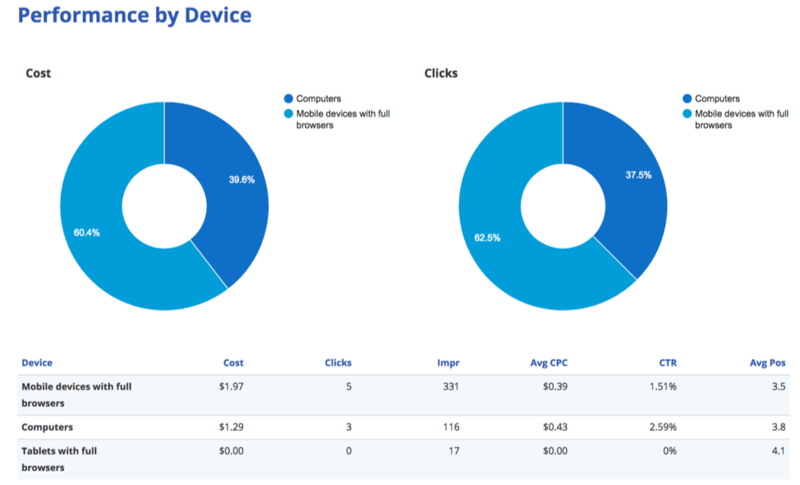 Here, users see key statistics like impressions and average cost-per-click filtered by the date range, device type, and network the user decides. It’s fairly similar to what Google offers and is along the lines of what you expect from this kind of software with the difference being users have more ways to compare certain data. A Chart on the Dashboard comparing Clicks and Cost for the entire campaign. After exploring the Dashboard tab, the “Insights” tool is the next feature Optmyzr offers. This is also where it is apparent that Optmyzr is capable of far more than AdWords is in terms of data compilation and analysis. There are a few components to this tool including a campaign comparison feature, an account quality score tracker, and a landing page analysis. Feature on the Insights tab that scores the quality of a user’s account. While the Insights tool is impressive, it’s not the most useful tool Optmyzr has to offer. As the name insinuates, Optmyzr’s best feature is its “Optimizations” feature. Users can run analysis on keywords, bids, and ads to receive recommendations that are designed to optimize the performance of the user’s campaign. This platform can also compile a year’s worth of data and suggestions and create an annual report in less than a few minutes. Page from the Annual Report comparing cost and clicks by device. This birds-eye view of Optmyzr’s capabilities is only a glimpse into what marketing automation platforms are capable of. Some aspects of SEO are tedious and marketing executives are looking for ways to automate those activities to save time. Optmyzr recognizes this and reminds users every time an analysis is completed of how much time they saved by automating the task with Optmyzr instead of performing it manually. As artificial intelligence begins to spread into the marketing field, it’s important for all marketing professionals to keep an eye on marketing automation tools like Optmyzr. This platform and others like it are likely to become a key part of the future of marketing automation. A prompt shown after running an Insights analysis.